Accents any bath décor with a designer touch. Immediately transforms the look and feel and of any bath setting. Unique and sure to be appreciated gift for any home. Decorate your bath like a designer in mere minutes; all you need is this all-in-one set! 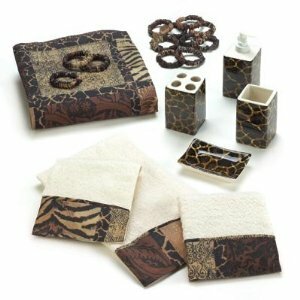 Luscious jungle print peps up any powder room with matching bath accessories. Set includes: shower curtain, 12 curtain rings, 3 hand towels, lotion pump, soap dish, toothbrush holder and tumbler. Set: 16 1/2″ x 14 1/4″ x 3 1/4″ high. Ceramic, polyester, plastic and cotton. Shower curtain and towels are machine washable in cold water; tumble dry low. Weight 3.4 lbs. Set.